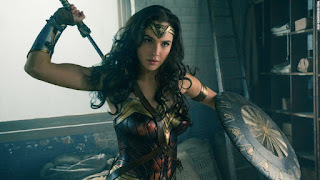 You, Me and Movies: Review: The DCEU jumps back on track with "Wonder Woman"
Review: The DCEU jumps back on track with "Wonder Woman"
I have been sitting here for a few minutes now about how to approach this review. I have had a complicated history with the DC Extended Universe films so far. I loved "Man of Steel," and if you asked me in 2013 if the new DC shared universe was going to sink or swim, I would have undoubtedly said swim. I was as manic as anybody when came to being excited for "Batman vs. Superman.'' Even if it was a shameless set up for a huge chunk of storytelling. The end result? Not so good. If you've been reading my blog, you know why. I have said everything I wish to say about that film, never feeling to discuss it again. That was the single biggest disappointment I have felt with a film in quite awhile. Then came "Suicide Squad," which was a slight step up from "Batman vs. Superman" but was just a generic carbon copy of every action movie being released this summer. I figured DC was having the problems Marvel faced in the early 2000's. Wanting badly to play ball with the big leagues, but having no direction or idea of how to do that. Then came "Wonder Woman." I can confidently say that the DCEU is split fifty-fifty in my book. "Wonder Woman" isn't just a step up from "Batman vs Superman" or "Suicide Squad." Its not merely just a good movie or even a great movie. "Wonder Woman" is an amazing movie, a mesmerizing movie, and easily the best of the DC bunch so far. Wonder Woman was the best part of "Batman vs. Superman" and her first full-length film in the live-action arena proved to be not just a fluke for the character or the actress Gal Gadot. "Wonder Woman" is awesome on every front. I could argue that perhaps DC should have stuck with introducing their characters in single films, like Marvel has done. I could argue that perhaps group movies are not the way to go. But that's not necessarily true. Most of the "X-Men" movies have worked just fine and I love "Mystery Men." What' needed to make these superhero movies work is hire people who like the character(s) and simply stay out of their way, let them make the movie they need to make. Its clear from frame one that director Patty Jenkins is passionate about these characters and their world. It seems so simple doesn't it, to simply let the people you hire to just do their jobs. Patty Jenkins brings a massive punch to the director's chair. Creating a world full of magic, but at the same time, a world we can believe in. She gets supreme emotion out of all of her characters. Plus, she orchestrates some damn fine action sequences, even though I personally hate slow motion. Here, she uses slow motion to her advantage, and elevates the action, instead of merely letting it draw to a quick close. Essentially, she made every good decision across the board. Gal Gadot plays Princess Diana, an Amazonian living on the island created by Zeus. Zeus put them there after Ares killed all the other gods on Mount Olympus. Zeus created the Amazonians in order to fight for mankind against Ares' corruption. Zeus placed a special weapon to defeat Ares, should he ever rise again, called The Godkiller. Priness Diana wishes to wield The Godkiller to fight Ares one day. Suddenly, a plane comes crashing through the safety net around the island, the plane belongs to Steve Trevor (Chris Pine) in the heat of battle during World War I. Trevor is captured by the Amazonians and questioned. He tells them he is a spy for Great Britain, and found plans for a terrible Mustard Gas created by Doctor Poison (Elena Anaya) for the Central Powers, supervised by Ludendorff (Danny Huston). This gas is capable of mass killings. Believing this is the work of Ares, Diana accompanies Trevor back to Earth to stop Ludendorff's plan. I knew there was something special about Gal Gadot when I saw her in "Batman vs Superman." I remember all the backlash when she got cast in the part. She's too skinny people would say. She needs to eat a cheeseburger others would say. I was curious as hell, and one thing is starting to occur to me. Body type has no place in the casting process, acting does. Plus, in the full costume, Gadot embodies Wonder Woman in way we've never seen before. She wholeheartedly becomes the character. She's loyal, funny, uplifting, encouraging and fierce. I loved every moment she was onscreen here. She commands the screen, just like any lead superhero does. Gadot has taken this whole and completely made it her own. Gadot is given a great supporting part in the hands of Chris Pine. Here, Trevor isn't just some love interest just for the sake of having one. In fact, at the beginning of the film, and also as it progresses, we have no idea if Trevor is a love interest. The relationship Trevor and Diana share is a friendly one, but the film takes its time setting it up. We get to know these characters, we get to witness them surprising and dazzling each other. Sure, it eventually gets romantic, but by that time, its earned. It isn't shoehorned in just to be there. Its not some mark off of a checklist. These are real feelings, created by real characters and dramatized by actors. The rest of the cast is solid, across the board. Connie Neilsen is perfect as Diana's mother and has some strong scenes early in the film. Robin Wright is great as Antiope, the woman who trains Diana at a young age. I've been loving Robin Wright on "House of Cards" all week, but I never knew just how badass she could be. I mean, damn, when Anitope and Diana accompany each other in battle, its a moment where breathing ceases to exist. She's amazing in this film, a sort of amazing we've never witnessed from her. Danny Huston creates another memorable villain here. David Thewlis shows up, and creates a strong performance, especially since his character changes the most over the coarse of the film. Patty Jenkins has cast her film perfectly. The score has Wonder Woman charges into battle will remain stuck in my head for a good chunk of the summer. I am going to call that now. Its primal and brutal and sets the mood in the best possible way. Music can elevate the material in a movie, and its a tool to use wisely, which is what happens here. There has been some complaining about the bait-and-switch at the end of the film, regarding some villains. But you know what? It didn't bother me much. Is it predictable? Yes, I would say that. You may be able to call it a mile away, but the villain's plot in this film is a heavily emotional one, and its hard not to look at it and understand their motivation. Superhero movies have proven that villains are tricky to create. But the villains in "Wonder Woman" work well. I can feel the life of the DC shared universe. More so than ever before. I can only hope that this is a great chapter in what will ultimately become a fulfilling franchise. "Wonder Woman" is proof that you only need to trust the people you hire, everything else will go as planned.